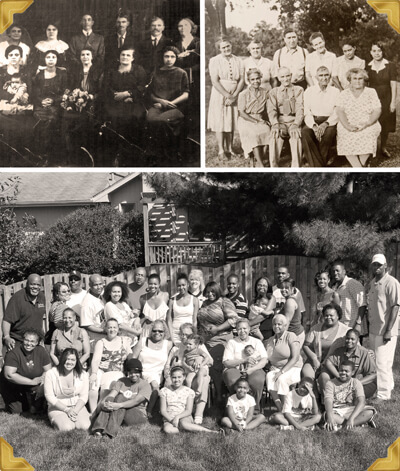 With Native Omaha Days over, another traditional African-American summer gathering, the Bryant-Fisher Family Reunion, begins. The biennial Native Omaha Days began in 1977. But it’s a newbie compared to the historic annual reunion that dates to 1917, when Emma Early Bryant Fisher inaugurated the event with a family picnic at Mandan Park near her South Omaha home. The picnic was held there for 30 years. Sunday’s picnic at Levi Carter Park will mark its 94th consecutive year. The Days and the reunion coincide only every other year. Just as NOD winds down, the reunion gears up, though there’s an extra week between them this time. NOD officially runs a week. The reunion, three days. NOD boasts signature events attracting sizable crowds. The Bryant-Fisher reunion has one main event – the sprawling, all-day August 14 picnic. The picnic moved to Carter Lake in the early 1990s. The picnic draws the biggest family throng. This mega extended family, whose population rivals that of many Nebraska towns, takes over a few acres at Carter Lake. The Bryants and Fishers exert a considerable presence wherever they encamp. They comprise what’s believed to be the largest African-American family around, extending over 12 branches. They’re so large they conduct their own census. At last count they numbered more than 2,200 direct descendants. If this year is like others, 500 to 800 souls will gather Sunday. “People just don’t realize the magnitude of it until they get there,” says Brooks, whose sister Cheryl Secret and mother Patricia Moss are family stalwarts. The enormity of the history and scope is a point of family pride. “I think it’s associated with pride, it’s associated with tradition, respect for our elders. By continuing this we’re respecting our great-grandmother,” says Secret. For milestone reunions like the 90th in 2007, when upwards of 1,000 or more gathered, the family throws its own Saturday parade on North 24th Street. In this frantic age, the reunion expresses solidarity and consistency. The family likes to say no matter where you are in the world, you know the reunion will be held on the second Sunday in August ,come hell or high water. Neither storms nor floods will deter it. “We’ve been rained on a lot of times, but not rained out,” says Moss, who by her reckoning hasn’t missed a reunion during her 85 years. Having something to count on helps this enormous family remain tight. “We may not see each other every day, but if you need us we’re there. That’s how we are,” says Juanita Sutton. Meeting and greeting at the picnic is an invitation for young and old to share where they fit on the vast family tree. “If someone says, ‘How are you related?’ it’s an honor to be able to go down the line as to how you belong in the family,” says Secret. Moss, whose grandmother was reunion founder Emma Early, does old school social networking at the picnic, where she seeks her closest cousins. “When I could walk I used to walk from one end of Carter Lake all the way to the other to make sure I saw every one of my cousins, especially my first cousins,” says Moss, who as an elder now has relatives come and wait on her. When she was still spry, her daughters shadowed her as she made the rounds. It ignited their interest in family lore. “We got to visit and develop relationships with all 12 families because we were with her,” says Brooks. Patricia’s daughters cherish their mother’s and other elders’ tales. “She loves telling us stories,” says Secret. “She’ll tell stories about racial things that happened in South Omaha, where they kind of pushed the blacks out, and how her father’s family stayed put. Her uncle sat on the porch with a shotgun and said, ‘I’m not going anywhere.’ They stood their ground. As if on cue, Patricia recalls how long-ago customs were enforced at the picnic. The Bryant-Fisher thing turns Carter Lake into a multi-colored tent city. Black folks of every shade and hue mingle. Eight generations worth. Some sport Bryant-Fisher T-shirts, complete with the family crest. Some “wear” the logo as body art. Jazz, blues and R&B mix with hip-hop. One could mistake it all for Native Omaha Days. But don’t confuse the two. The family is protective of what they have and don’t like sharing the spotlight. The reunion’s longevity and large turnout regularly attract media notice, even gaining Guinness Book of World Records mention. During election cycles the picnic’s known to bring out politicians in search of votes. Party crashers are not unheard of. Rev. Doyle Bryant, pastor at Shiloh Baptist Church, says his family’s commitment to staying connected, and the reunion’s high profile, explain why it’s endured and why it’s coveted by outsiders. But there are posers, too. “We’ve got a whole lot of wannabes,” says Patricia Moss. With a family this size, it’s impossible to know everyone. “I think it’s intimidating, especially for the people who come from out of town maybe only every five years,” says Secret. “You walk through the park and you know all these people are your relatives, but you just don’t have a clue who they all are. Paul Bryant says he had to overcome his own shyness to fully partake in the reunion. And the lineage beat goes on. There have been countless occasions when two young people who are sweet on each other find out they’re cousins. Arlett and Cheryl had it happen to them, as did most of their cousins. “I went all the way through high school with a guy and one year I seen him at the family picnic. He said, ‘This is my family,’ and I’m like, ‘Well, where have you been all of these years?’ Sometimes, they’ve been there and you’ve been there, you just haven’t seen each other,” says Arlett. Cheryl began a family genealogy book 16 years ago. Arlett’s revised it every five years. The family consults it when there’s a question. Not that friends aren’t welcome, they are. “I have two girlfriends I’ve been knowing all my life, and they don’t miss it,” says Mary Alice Bryant. Coming on the heels of Native Omaha Days, it makes for two weeks of black pride heritage celebrations. Thousands flocked back for the July 27-August 1 Days. They came from Georgia, Alabama, Texas, California, Back East and every which way. Hundreds will do the same for the reunion. Some stay for both. Folks catch up with family and friends, revisit old haunts and make the rounds. The Days is a succession of reunions, picnics, barbecues and block parties. There’s music, dancing, card playing. Church. A parade down North 30th. A communal picnic at Elmwood Park. A Blue Monday at local watering holes to tie one on before parting-is-such-sweet-sorrow goodbyes. The Bryants-Fishers turn out in force at The Days. A family matriarch, Bettie McDonald, co-founded the event and its sponsoring Native Omahans Club. Not surprisingly, the itinerary is patterned after that of the Bryant-Fisher bash. Though the Dozens of Cousins picnic has changed, one thing that hasn’t is the dawn fish-fry breakfast, followed by a church service. Other activities include a talent contest, volleyball, foot races, fishing. Pokeno, gin and dominos are the favored card games. There’s a formal dinner dance Friday night at the Lake Point Center, a Family Fun Day Saturday at Fun-Plex and various odds and ends. When the family has a parade, Bryant-Fisher floats and drill teams pass by the Native Omahans Club on North 24th. The building doubles as the family clubhouse for Dozens of Cousins meetings and fish-fry dinners. Just as The Days ends on a blue note, some relatives will ring out the reunion on Monday at the club or a bar – tilting back a few to bid each other farewell, till next year. For Paul Bryant, the reunion’s been a given his whole life, and with it the realization his family is far from ordinary. “Some of my earliest childhood memories are at family picnics at Mandan Park,” he says, “and of some of the same things still going on today. The dance contest, the races. We used to almost always go down to the bottom of the hill to play football. Bryant sees the reunion as continuity. An each-one-to-teach-one opportunity for older generations to impart the family heritage and tradition. “I always knew we have a big family,” says Bryant. “When I was 8 or 10 they’d hold a program with a dinner and the mayor or someone would speak. I was like, ‘Wow, there’s something special here.’ Politicians come to the picnic and press the flesh. I mean, there’s a lot of people there and a lot of them have done some things in the community. He enjoys discovering some notable is a relative. He’s a notable himself. He excelled in sports in high school and college, then embarked on a fast-track corporate career before assuming leadership of the Nebraska Urban League. He found a new mission as executive director of the Wesley House, where he formed an excellence academy. Today, he’s a presenter at schools with his purpose-driven leadership program. Bryant, his wife Robin and their three kids are widely recognized for their community service. He says high achievers in the family, whether the late coach-educator Charles Bryant or current young hoops star Galen Gullie or the family’s bona fide celebrity, actress Gabrielle Union, serve to inspire. Union gets back for The Days some years and for the reunion others. Her appearances, lately with NBA squeeze Dwyane Wade, cause a sensation in the black community every bit as electric as the buzz Lady Gaga generates among her Little Monster fans. The family is unapologetically possessive in claiming “Gabby” as their own. Paul Bryant’s as starstruck as the rest, but he’d rather his kids view their elders as role models and their family history as cool. “My son can tell you, ‘My dad’s Paul Bryant, whose dad was Doyle Bryant, whose dad was Marcy Bryant, whose dad was Thurston Bryant, who’s the son of Emma Early, who’s the daughter of Wesley Early, who’s the son of a plantation owner. Ninety-four years since it’s start, the reunion appears set for the future. “I think it’s embedded in so many of us we couldn’t stop this thing if we wanted,” says Cheryl Secret. “I think in each tribe there are children who will make this thing happen, no matter what.